Renegade Brewing Company of Denver, founded in 2011, is known for making top-notch and out-of-the-ordinary India Pale Ales. Redacted, the flagship of Renegade, is a bold Rye IPA with 20% Rye and has been the top seller for the company since opening the doors. Endpoint, a triple IPA at 11% alcohol by volume and single hopped with Summit hops, is another top seller for the brewery. 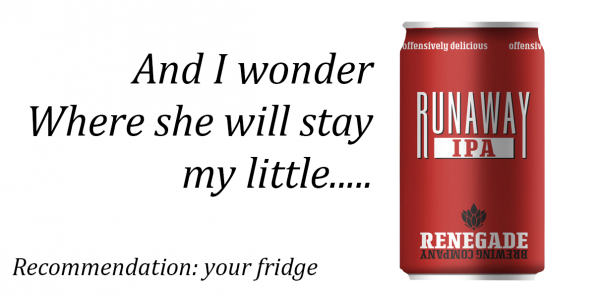 After growing a reputation for hoppy beers, this summer, Renegade will add a third canned IPA to their lineup with the release of classic West Coast style IPA, dubbed Runaway. Renegade brewed Runaway to be a star example of a West Coast Style IPA. The West Coast Style is characterized as being hop-forward with a simple malt bill, and often utilizes hops grown in the Pacific Northwest that are known for being citrusy or piney. Runaway will be the light-bodied bitter beer expected from a West Coast IPA. Hops used in Runaway include El Dorado, Amarillo, and Azacca. Azacca is a fairly new hop variety that imparts the flavor of tropical fruit. With Azacca alongside El Dorado and Amarillo hops, Runaway will exhibit bright fruit notes and a floral nose that is followed by sharp bitterness. At just 6% alcohol by volume, this IPA will allow hopheads to enjoy more than one. Brewers at Renegade spent months testing and creating the recipe for Runaway IPA. Those who have visited Renegade’s taproom at 925 W. 9th Avenue over the last three months have had the chance to participate in the creation of this recipe. Three test batches were brewed with subtle differences in hop additions, time, and quantity. Guests of the taproom were invited to try the beers and leave comments in which they preferred and why. Feedback was considered and new recipes created until the final product was ready. IPA Project #1, #2, and #3 are still available in the taproom. The new can will be available in 6-packs in all of Renegades five markets including, Colorado, Kansas, Nebraska, Wisconsin and Arizona. The summer seasonal is available from June through August.